Adapted from the articles “The Science (and Art) of Ethephon Use on Walnut” by Robert Beede, UCCE Farm Advisor Emeritus, Kings County and “Ethephon use considerations in the Sacramento Valley” by Janine Hasey, UCCE Farm Advisor, Sutter, Yuba, and Colusa Counties. 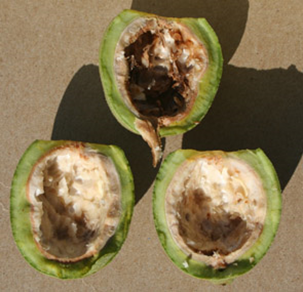 Ethephon, also known as Ethrel®, is an ethylene-based plant growth regulator applied at walnut maturity, or shortly thereafter, which accelerates hull cracking and separation from the shell. This advances walnut harvest by four to seven days, depending on the season and variety, and nut value is increased by lighter kernel color and possibly less insect damage. Treating only some blocks of the same variety can spread harvest timing and drying into more manageable allotments. Proper application and timing are essential for a successful response. Walnut kernels are physiologically mature well ahead of their natural drop from the tree, when the tissue surrounding the kernel has changed from a bright white to oak colored, commonly referred to as Packing Tissue Brown (PTB) (see Fig 1 & 2). Kernel maturity often occurs 21 or more days ahead of unaided commercial harvest. During this period, the hull separates from the shell and cracks from tissue breakdown and moisture absorption. In this time, the kernel also ages, resulting in darker, less valuable nuts. The risk of insect damage, principally from navel orangeworm, can also increase. Is Ethephon right for me? Perhaps not. Users must monitor once or twice weekly for PTB, applying the product at night or early morning to avoid temperatures approaching 900 F, and have control over harvest timing. Your dehydrator must also be open and prepared to process your early nuts promptly. Additionally, orchards stressed from under or over irrigation, heavy mite infestation, root or crown diseases, or other problems may see more leaf drop prior to and after harvest, complicating it. How do I time treatment? PTB occurs last in the bottom of the canopy. Fully shaded canopies have greater maturity variability than those with full sunlight. Water stressed orchards develop PTB sooner than well-watered orchards. 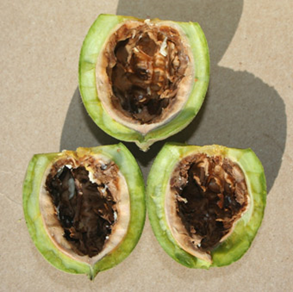 Early walnut varieties such as Serr develop PTB sooner (mid-August) than late varieties such as Chandler (mid-September). Begin sampling at least two weeks ahead of when PTB is expected. Walk diagonally across the orchard and collect at least 100 nuts. Cut each collected nut in half. Only nuts with complete browning of the packing tissue, including the area near the stem end, are considered at full PTB. Do not treat until 100% of nuts are at PTB. It is better to apply late than early, since early ethephon application results in losses in weight, nut quality, and hullability. Applying five to seven days after PTB still improves percent nut removal and the chances of having to only harvest once. Do all walnut varieties respond similarly? Walnut cultivars differ in their sensitivity to ethephon. Out of Serr, Payne, Tulare, and Chandler, Serr produces the least ethylene after treatment and shows a marginal response in the field. Tulare produces the most and falls off the tree shortly after treatment. Growers report Howard is also very responsive to ethephon in Northern California, resulting in greatly enhanced quality and value. In the Sacramento Valley, ethephon can be applied from the ground or aerially. For ground application, four to five pints of product are added to 150-200 gpa, with ground speeds between 1.5 and 2 mph, depending upon canopy size. Ethephon does not translocate. It must hit the nut to create the desired response. Experience shows greater response under higher humidity and lower temperatures. Never apply in temperatures exceeding 900 F. Performance improves with increased absorption time, so do not apply if there are drying winds or rain forecasted. For aerial application, aerial use rates of two to four pints in 40 gpa have been reported. Aerial application and ethephon concentrations greater than those recommended for ground treatment (900 ppm) are allowed by the label, but not supported by the manufacturers. Rates higher than recommended may result in excessive defoliation, reduced catkin formation and twig dieback. The benefits of ethephon application are usually seen 14 to 23 days after application. Test shake a tree and evaluate hull adhesion before committing to harvest.